Tim Kelly, an undercover narcotics agent, is in Mexico at the hacienda of his long time friend Rodolfo Guzman. Kelly is there on the pretense of helping his friend but he is secretly working to expose Guzman and bring him to justice. Guzman is a leader of the violent Campeche Cartel which deals in drugs and human trafficking and the US Federal Narcotics Bureau has been trying to shut the Cartel down for many years. With Kelly’s help, they hope to finally put a stop to the Cartel’s dangerous exploits. But within the first few pages of Point Deception, Kelly’s true mission is exposed by Raul Martinez, a.k.a., “Rucho,” an underling of Guzman who, we learn, has reasons to bring down both Kelly and Guzman. Guzman decides against a quick death for his friend and instead orders that Kelly be given heroine. That way he’ll soon be addicted and begging for his life to end. When Guzman is called away on business, Rucho takes over and immediately adds physical torture to the mix. As Kelly fades in and out of consciousness, he escapes into memories of his childhood growing up along the Texas Gulf Coast. The bulk of Point Deception centers around Kelly’s life before his capture and torture at the hands of the Campeche Cartel. We learn of Kelly’s rough upbringing after his parents’ divorce and the beatings he took by the likes of Rucho, one of many tough Mexican boys who picked on the hot-headed Kelly. But Kelly learned to fight thanks to two friends, the Paterson brothers, and along with the help of a kindly Mexican, Rodolfo Guzman, who lived just over the Rio Grande River in Mexico, Kelly managed to muddle through. When Kelly was 14, he decided it was time to leave his small hometown and find his fortune. Through a series of jobs and travels, the young man eventually landed in New Orleans. Figuring out how to falsify a birth certificate, he enlisted in the Coast Guard and set off for great adventures. While Kelly loved the Coast Guard and his radio skills proved valuable, his hot temper continued to get him in trouble. After one too many fights, and faced with a dishonorable discharge, Kelly is offered the option of going to Vietman. The young man, cocky and over-confident, takes the Coast Guard up on their offer and is soon on board the Point Deception, a Coast Guard patrol boat. Kelly’s service aboard the Point Deception, the horrific battle he and his friends encounter, and the military’s subsequent blame-game eventually lead to the man’s exit from the Coast Guard. It is here that Kelly is talked into becoming an undercover narcotics agent by another old friend, Deputy Sheriff Dave Holt. 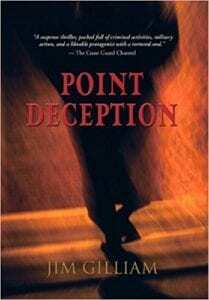 Point Deception is split into three sections; a brief segment introducing Kelly’s current predicament at the hands of a drug lord, the memoir of his life from just after his parents’ divorce through the discharge from the Coast Guard, and the final section where the reader learns of Kelly’s initial undercover work into the Cartel’s dealings and his subsequent torture. The story starts off with nail-biting tension as Kelly is confronted by Guzman and Rucho about his covert activities and then eases slightly as the author takes us to the protagonist’s early life. But the tension slowly starts to build again as we know all along that at some point Kelly is going to find himself back at the hacienda being tortured. Will he escape, be rescued, or come to a worse ending? Wanting to learn the outcome will keep the pages turning in this military suspense novel. The author takes time to build the characters’ backgrounds and indeed, that is part of what makes this story interesting. Kelly has a long and unusual history with Guzman while Rucho’s hatred for Kelly has been brewing for many years. By the time we get to the final section, where Kelly is being tortured, the characters and their interactions all fit together perfectly. Given the backgrounds of each character, the surprise ending is particularly satisfying. The author is retired military and his background adds credence to the story, but perhaps in an effort to keep the dialogue free of military “colorful” language, the conversations sometimes feel forced. In addition, the text is a bit confusing in places due to a lack of editing. An overabundance of commas and an unusual use of quotation marks with dialoge make it difficult at times to follow which character is speaking. A careful review from an editor would make this book a much more enjoyable read. Quill says: Fans of the Coast Guard, and those who like a good military-based suspense novel, will enjoy Point Deception.